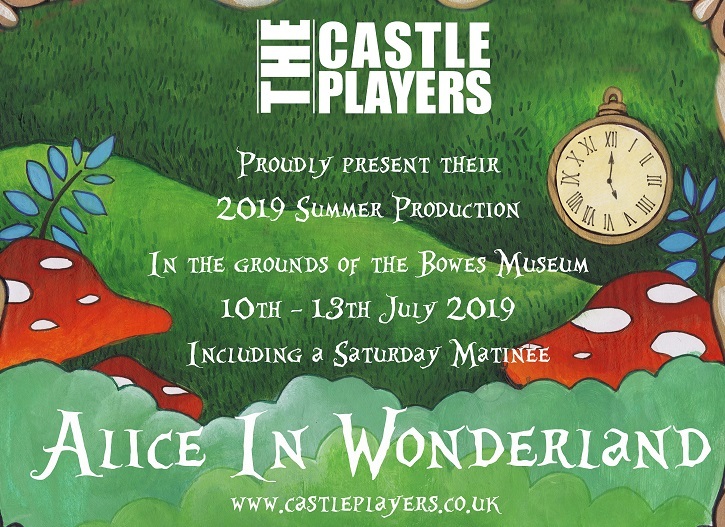 The Castle Players summer production which is always outdoors (whatever the weather!) in the grounds of the Bowes Museum. There is a 30-minute (approx) interval at each performance, with expected finishing time for the evening performances being 10pm and 5pm for the matinee. You can pay for a reduced price programme when ordering tickets. You will receive a voucher to exchange for the programme at the performance. On site catering will be available from the Mad Hatters Tea Room. Bar available from Caps Off from Bishop Auckland, Ice Cream from Chocolate Fayre and sweet treats from Sugarmouse. There are no boxes on sale for this years summer production. Saturday matinee parking is likely to be at full capacity so arriving early is advised. Any tickets still available can be purchased from the on-site box office from 6pm on each performance night.